"Winding instead of Knitting" - get cranking! The new book for the addi-express Kingsize: 24 patterns with ideas and techniques for the larger ADDI Express Kingsize knitting machine. Detailed instructions for 24 designs, with knits for all the family, including jumpers, hats and scarves, soft furnishings and more for quick projects that make great gifts. 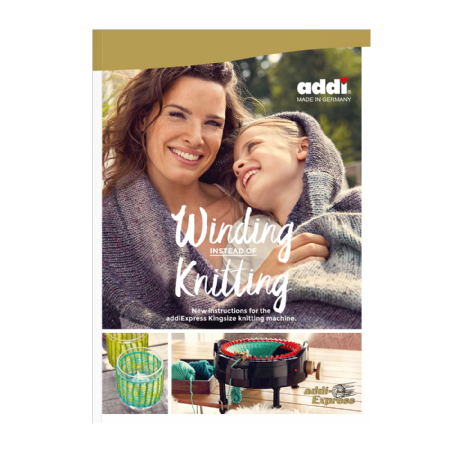 From summer jumpers to rugs for children's rooms and home decoration, there is something here for every fan of the addiExpress Kingsize knitting machine. The knitwear designer Ute Krugman has created 24 wonderful, exclusive models. The yarns used have been selected for their long-term availability from the manufacturers. Beautiful presentation with images and detailed instructions make this book a real inspiration.